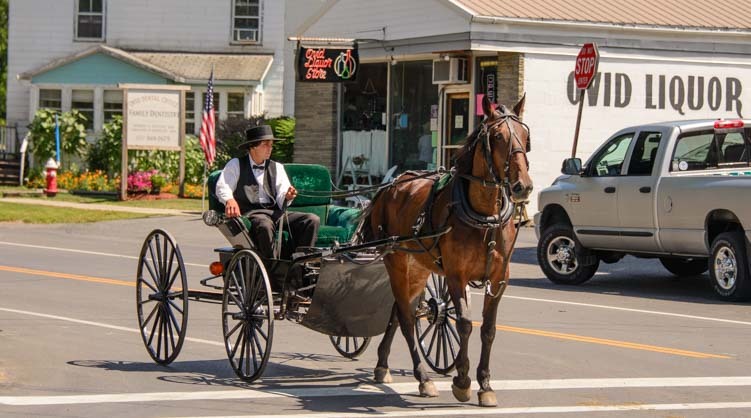 August 2015 – During our stay in the Finger Lakes of New York we were fascinated by the comings and goings of the Amish. We saw them all over the place and were fortunate enough to meet a few Amish people and even see some Amish farms at work. Their horse buggies are intriguing. They have enclosed family-style buggies and open air two-seaters that look like a lot of fun. These fun buggies were everpresent. One young man showed us his two-seater open-air buggy up close. Rubber does not meet the road on these vehicles. They have steel tires! They also have well crafted drum brakes. Mark joked that soon he’d be upgrading to disc brakes like we did on our trailer!! I asked him what a buggy like his cost, and he said around $3,000. As for a horse, he said it depends on whether you want a fast one or a slow one. Sound familiar?! The fast ones are more expensive, on the order ot $3,000 or more. A slow one can be found for around $2,000 or maybe less. As he described what it takes for a young adult to buy a horse and buggy, his sparkling eyes and fresh faced good looks were no different than those of any other kid dreaming of a set of wheels. That youthful longing for the freedom that comes with keys (or reins) to your own personal ride is a truly universal teenage quest! The two seater, favored by young men for courting, costs around $3,000. 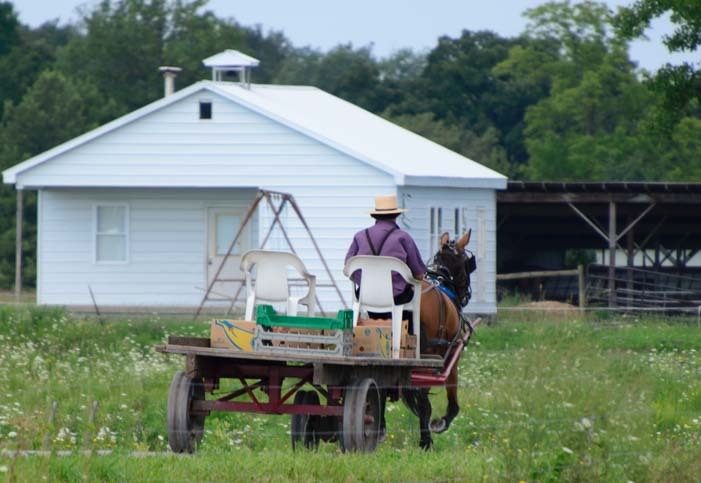 The Amish are hard workers, and we caught glimpses of them working in their yards and fields. Everything is done without the aid of gasoline powered engines and electricity, but their houses were big and tidy, and their lawns were neatly mowed. Out in the farm fields they use teams of horses for plowing. 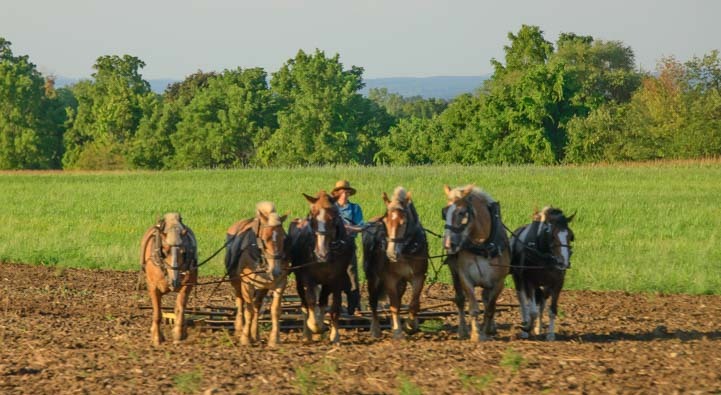 Our friend Ralph, who is neighbors and friends with several Amish families that live nearby, and who grew up on a farm himself, commented that the Amish are always careful not to overwork their horses. “They use twice as many horses as we would have for the same job!” he said at one point. What a contrast it was to attend the Empire Farm Days trade show and festival in Seneca Falls. 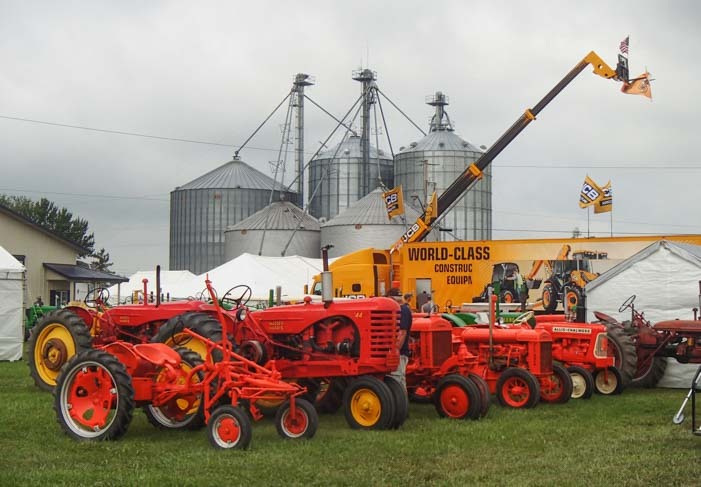 Human sized farm equipment went out in the 1950’s, and the machinery that is used today is truly gargantuan. Empire Farm Days in Seneca Falls. This machinery cultivates plants! A little different than the small Amish family farms scattered around the trade show. We walked around the fair grounds wide eyed with wonder at the size and scale of the machinery. 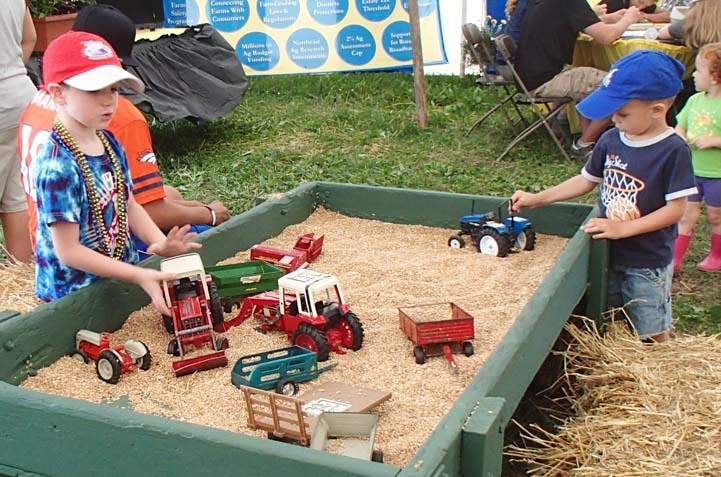 We noticed a few future farmers playing with some tractors in a sandbox. 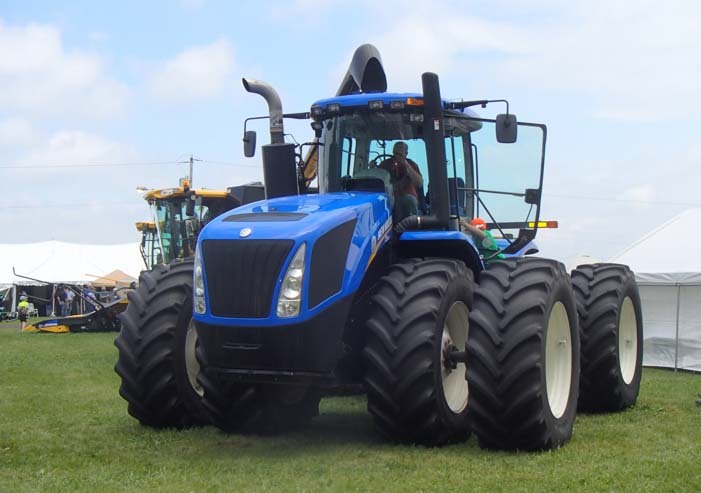 Those little kids probably can’t wait to drive a combine for real. Meanwhile, back in the world of the Amish, a different kind of farm gathering was taking place. 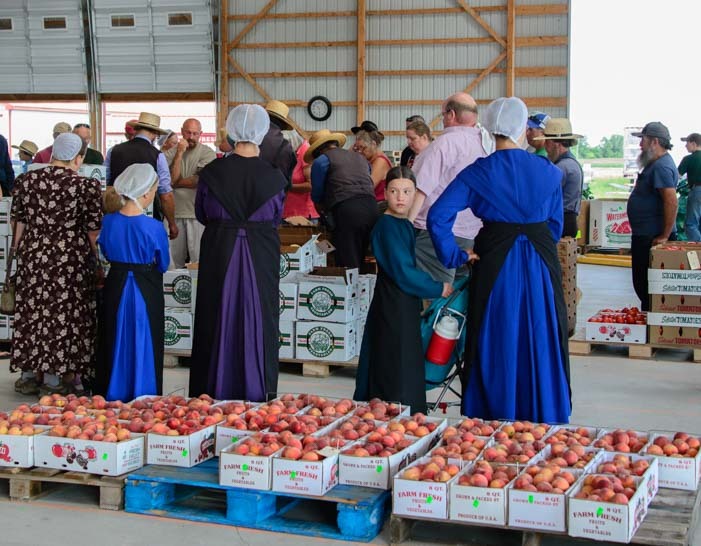 We attended the Seneca Produce Auction in Romulus and were blown away by this event that is at the heart of Amish farming culture in the area. Outside, the horses and buggies were all lined up while the farmers took their wares inside to auction them off. 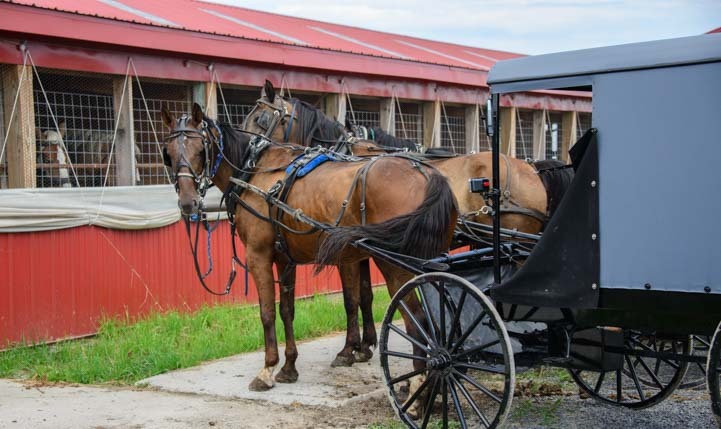 Amish horses and buggies line up at the Seneca Produce Auction. A one horse power engine — parked and resting. 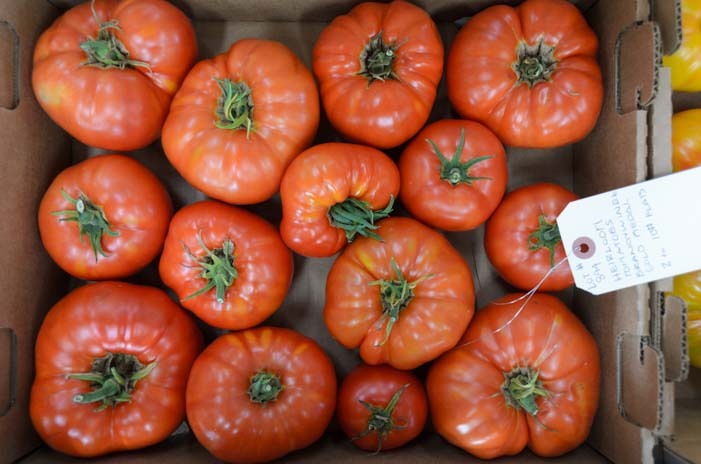 Inside, huge boxes of beautiful, ripe melons and corn and cucumbers and peaches and tomatoes were all lined up. Huge cardboard boxes of produce filled the auction hall. 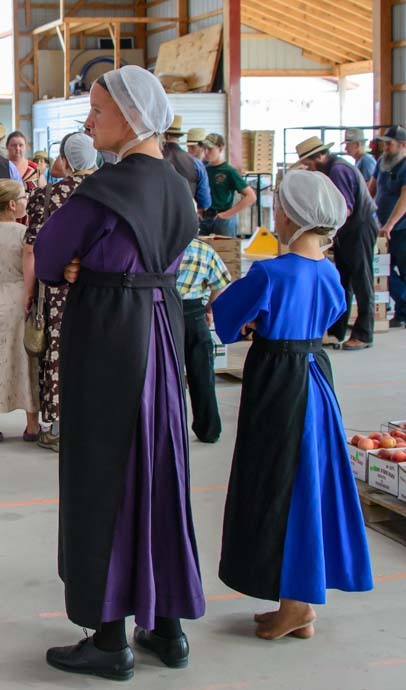 Amish men and women were dressed in black and royal blue. The men wore straw hats with a ribbon and the women wore white bonnets. It was summer, and the kids were barefoot. They all milled around, watching the proceedings. 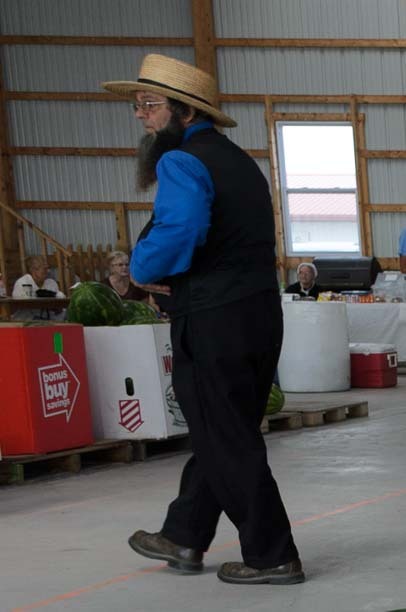 Bearded Amish men and women in white bonnets, all wearing black and royal blue, went about their tasks at the auction. An auctioneer moved from one box of produce to the next, singing in a totally unintelligible patter, selling off this wonderful produce to buyers from the nearby markets. Next to him, an assistant scribbled furiously on a clipboard. The auctioneer’s fabulous song rang out off the walls of this building, but we could not make heads or tails of his words. Try as we might, it was impossible to know what he was selling or to whom or for how much! that we couldn’t understand at all! He moved quickly, and the crowd shuffled along with him, inching from one box to the next. Obviously the folks right around him knew exactly what was going on, and a raised eyebrow or wave of a finger probably bought them a crate of cantaloupes. So there wasn’t a lot of random arm waving going on! 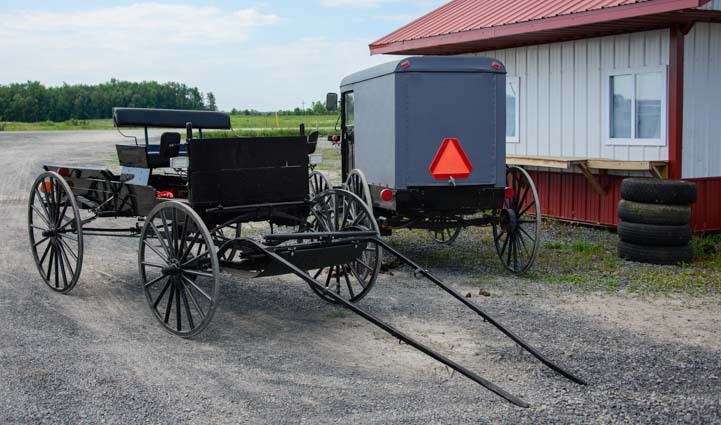 Both Amish and non-Amish men moved the boxes from the auction hall out onto waiting horse drawn carts with forklifts. It wasn’t clear to me how the forklifts were propelled, but the Amish were careful not to drive or operate any machinery that wasn’t within their code. Non-Amish mingled with the Amish freely throughout the auction hall, some buying produce that got loaded into their trucks and some just watching the fantastic goings-on. The produce was beautifully ripe and ready. It was a wonderful scene, and probably not too far different than one that would have been typical at the turn of the last century in farm towns across the country. Simple white caps and black aprons over long dresses. I had been amazed to discover earlier on that the Amish speak German at home first and then learn English in school (which they attend through the eighth grade). They call their everyday German dialect “Pennsylvania Dutch,” but they conduct their church services in High German. I asked one woman if she could converse easily with Germans travelers who visited the area, and she said they could, even though many words are different. How intriguing it is that they are all essentially bilingual. Besides first generation immigrants, there aren’t too many communities in America that deliberately raise their children to speak two languages fluently, especially that choose to teach English as a second language. I was charmed by their accent when they speak English. It is essentially a standard American accent, but a few words here and their caught my ear as sounding a little different. Working on the crates of melons up front, the row of peaches will be next. 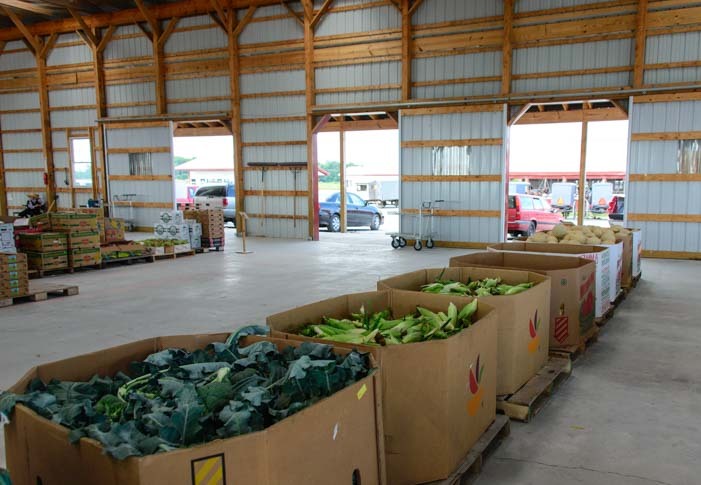 As the produce auction progressed, the row of horses and buggies outside the auction hall grew smaller as people left with their boxes of watermelons and tomatoes in tow. Hauling produce away in an Amish flatbed trailer, complete with plastic chairs for driving. The horses pulled flatbed wagons, quite different than the buggies we had been seeing around town until now. A few horses were even set up for a triple tow, pulling the family buggy with a flatbed trailer hitched up behind. Some Amish even triple tow with a horse, family buggy, and flatbed full of fruits and veggies hitched behind! What a heartwarming delight it was to be able to brush shoulders with the Amish a little bit during our travels and to learn about their way of life and see them in their daily tasks. We really cherished our time spent in their company and left wanting more. 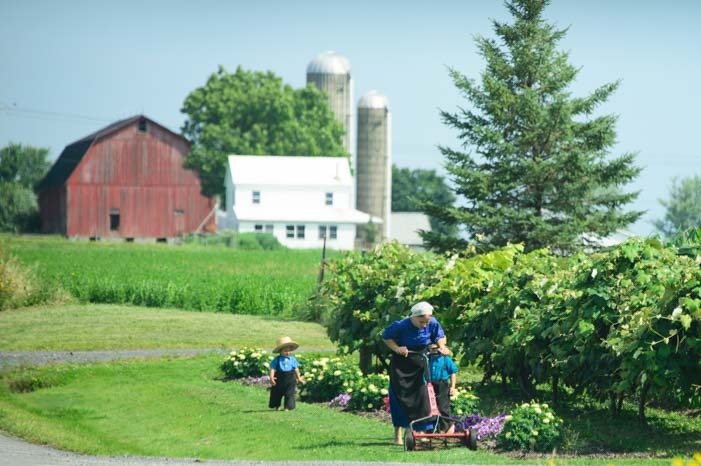 The Amish community is growing rapidly, benefiting hugely from the decrease in infant and childhood mortality nowadays, and their numbers are increasing at around 5% a year. Much to our surprise, we learned that their population doubled between 1991 and 2010. 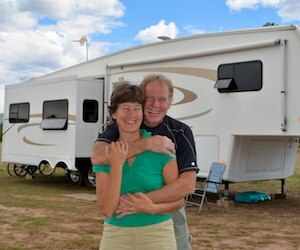 The New York Finger Lakes are a wonderful area for an RV road trip. 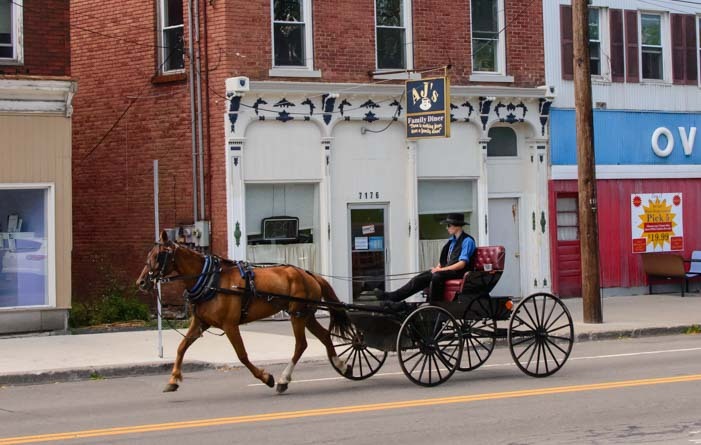 From quiet country roads, to encounters with the Amish, to the absolutely breathtaking beauty of Watkins Glen, is it a place well worth making a detour to go see! This entry was posted in New York and tagged Finger Lakes NY, Markets, New, New York, Special Events, Travel, USA, WP Travel by Roads Less Traveled. Bookmark the permalink.